If you've been reading my blog for a while, you may have noticed my growing appreciation for gin. I started off not having ever really touched the stuff, and now I'm at a stage where my last gin-related post is my second most-read ever. My husband has also grown to love the stuff, so it's become the spirit of choice in our household. When Stirling Gin asked if I'd like to try their new Folklore Collection of gin liqueurs, it was an obvious yes from me! We live fairly close to Stirling, and my husband is from Dunblane, so it's very exciting to try out a local Scottish distillery. Stirling Gin is the brainchild of June and Cameron McCann, who launched the first Stirling Gin Festival in 2014. 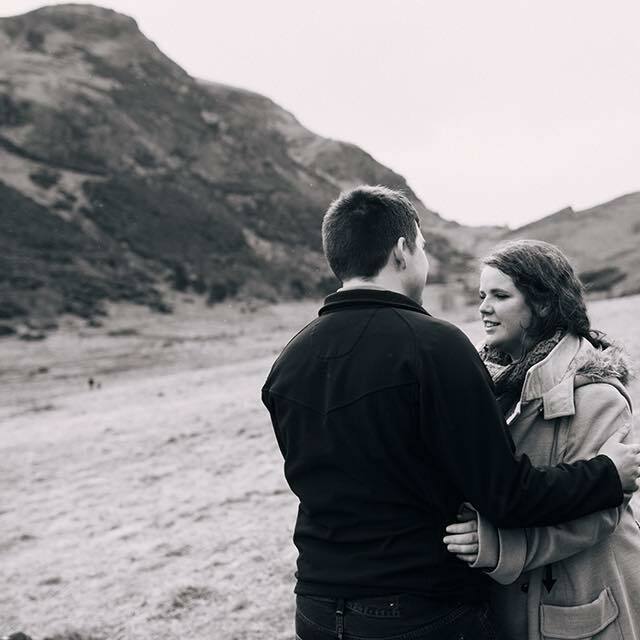 By Spring 2015, they began distilling their own gin, a blend of juniper, basil, angelica, orange, lemon and wild Stirlingshire nettles, and their first batch was distilled on their 26th wedding anniversary on 28th October 2015. You can read more about their story here! Now Stirling Gin are launching their new Folklore Collection of gin liqueurs. Their liqueurs use the classic Stirling Gin and flavour it with fresh Scottish fruits and herbs, giving a sweeter, fruity taste and a lower alcohol strength. The liqueurs are completely natural in both colour and flavour which is amazing! You can drink them neat over ice, as I did, or you can add them to your favourite sparkling wine for a splash of fruitiness. The Folklore Collection currently consists of two different gin liqueurs: Red Cap and the Green Lady. Before I talk about the actual drinks, I just need you to really take a look at the gorgeous artwork on the bottles! These stunning images really encapsulate the folklore theme, and were designed by Ritchie Collins, a Scottish artist now based in my hometown of Edinburgh. I absolutely love the bottles, they are so unusual and eye-catching. I also really love the wax-sealed tops, they look very classy. They would make really beautiful gifts. "If you meet a wicked Red Cap on your walk through the countryside you may find yourself spirited away to the fairy realm, a place of ghosts, magic and bloody mischief. We just hope you can find your way back." For those of you who might not know, in the Scottish Borders, legend has it that the Redcap is a malevolent goblin who inhabits ruined castles, murdering those unlucky enough to come across him by chucking rocks at them, and soaking his cap in their blood. So, as adorable as he looks on the bottle, beware him if you spot him! 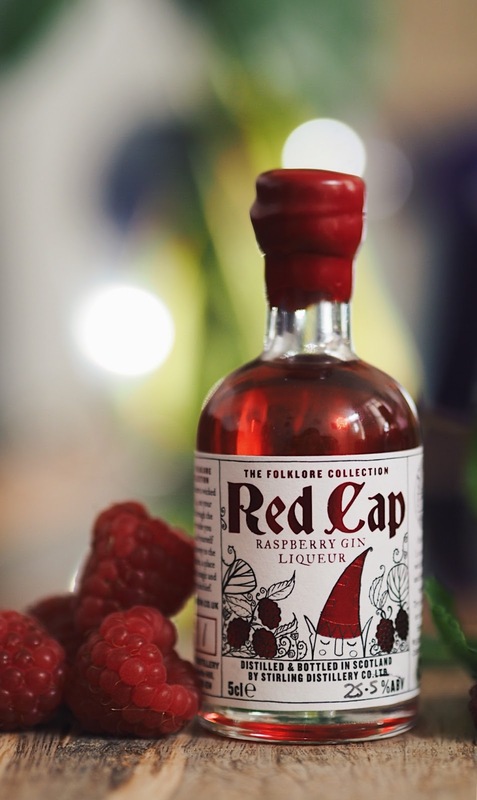 Red Cap gin liqueur is flavoured with fresh Scottish raspberries, and it. is. delicious! It is fruity and sweet, with a hint of the raspberry's tartness to ward off any sickliness. I'm a huge fan of fruity drinks, and this is perfect. You can taste the gin but it isn't overwhelming; in fact it's very smooth and drinkable. I can see this being delicious in a cocktail, as it has a subtle but distinctive taste, would work well with a variety of flavours, and would add a great splash of colour to the mix. "Often seen in the grounds of Stirling Castle, the ghost of the green lady likes to watch the townspeople go about their business. Once an attendant of Mary Queen of Scots, she perished in a fire while saving her queen." On doing a little more research into the story of Stirling Castle's Green Lady, I've discovered that, a bit like the Redcap, she's not good news if you spot her. Despite rescuing Mary Queen of Scots, if any mere mortal locks eyes with her, they'll apparently never see another dawn - not ideal. Luckily, The Green Lady gin liqueur isn't a terrifying curse, but instead a beautiful blend of gin, mint and brambles. I have to admit that while I like mint, I can be a bit funny about it (I hate minted peas, for example) so I was a bit apprehensive about this. Luckily, my fears were completely unfounded - this was minty and fresh, but the bramble helps smooth the flavour and retains a fruity note. This actually felt cooling to drink (yes, I had it over ice but you know what I mean!) and was incredibly refreshing for an alcoholic beverage. I feel like this could be awfully dangerous on a sunny afternoon, as it was very more-ish! Are you a fan of gin liqueurs? Or do you prefer the classic G&T? *I was sent these samples by Stirling Gin in return for a review but all opinions are my own and are 100% honest, as always!